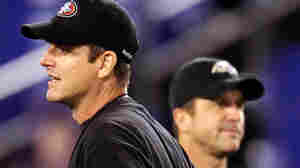 January 21, 2013  Baltimore, coached by John Harbaugh, will play Jim Harbaugh's San Francisco team in Super Bowl XLVII on Feb. 3. Teams coached by brothers have never before met in the NFL's championship. Harbaugh (in dark cap and jacket) and Schwartz (in white jacket with blue stripes) are separated by the 49ers' Venron Davis (85). 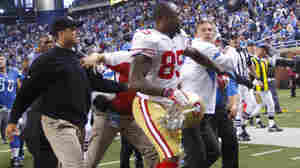 October 17, 2011  After 49ers coach Jim Harbaugh slapped Lions coach Jim Schwartz on the back following Sunday's game, things got kind of wild on the field. Watch the brouhaha.